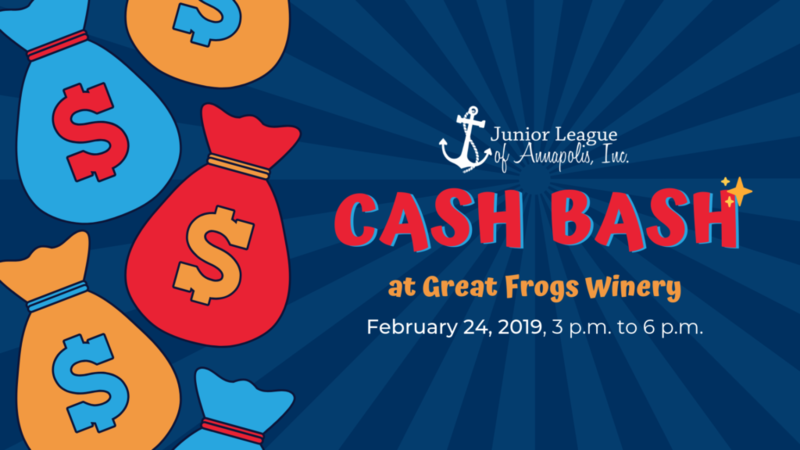 JLA is partnering with Great Frogs Winery in hosting our fourth annual Cash Bash! Open to the public, two-thirds of the proceeds from Cash Bash will benefit the community programs of Junior League of Annapolis. This includes our work with the Anne Arundel County Partnership for Children, Youth and Families to establish a Community of Hope in Brooklyn Park, and our Coaching for Life partnership with Serenity Sistas, which supports women in recovery from alcohol or substance abuse, providing them with a chance to re-enter life. There will be two ticket options available for purchase – one is an “entry” ticket for $25 per person and the other is a “lottery” ticket. Entry Ticket – There are 75 entry tickets for sale at $25 per person and is required to attend the event. It is your way into the venue and a wine tasting. Entry tickets do not count towards financial points. Lottery ticket – There are 200 lottery tickets for sale at $30. Attendees are welcome to purchase as many of these tickets to increase their odds of winning the Cash Bash purse money. Any remaining tickets will be sold at the door for $35 each. Online ticket sales will end February 23, 2019 at 11:59pm. Raffle tickets for sale at the event for a chance to win some awesome prizes, including jewelry, fitness class passes, and 2 tickets to the Annapolis Oyster Roast and Sock Burning event in March! BrickNFire Pizza will be running a special on their pizzas, and there will also be live music! Don’t miss out on this event and help Junior League of Annapolis raise money to sustain our mission. For more information about this event, please contact gala@jlannapolis.org. You may also contact Junior League of Annapolis, Inc. at 410-224-8984 or visit www.jlannapolis.org.